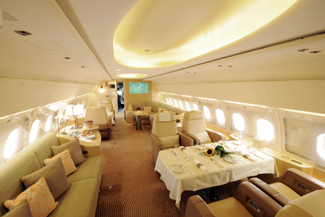 The Airbus ACJ319 on display at this year's NBAA is operated by Tyrolean Jet Services and is offered for vvip charter. All of the business jet variants launched in recent years feature larger cabins than their predecessors, highlighting the market's wish for more cabin. Airbus will be highlighting its leadership of this trend by displaying an Airbus ACJ319, with the widest and tallest cabin of any business jet, at the NBAA show. The Airbus ACJ319 on display is operated by Tyrolean Jet Services and is offered for vvip charter. It features lounge areas at the front, a bedroom with ensuite bathroom and shower in the middle, and business-class seating in the rear, and is certificated for 19 passengers. “More space in the cabin is desirable for many reasons other than the greater comfort and freedom of movement that it brings,” explains Airbus chief operating officer, customers, John Leahy. “The larger cabin volume and floor-area of Airbus corporate jets means you can take more people with you when you travel, be more productive along the way, and carry more baggage,” he adds. The desire for a large cabin is one of the findings of Airbus' ACJ Billionaire Study, announced earlier this year, which highlighted the wish of high net-worth individuals to take with them when they travel, those that look after them at work and at home. Airbus' ACJ318, ACJ319, ACJ320 and ACJ321 fit into the same sort of ramp space as traditional business jets, but their cabins are almost twice as large, offering a very different travel experience, in which people can socialise more easily by moving around the cabin. Airbus corporate jets deliver more than traditional business jets, such as extra baggage-space, pilot-pleasing Category 3B autoland, and mechanic-friendly engine and systems access. Part of the world's most modern aircraft family, Airbus' ACJ318, ACJ319, ACJ320 and ACJ321 are enjoying huge success with airlines, which have now ordered more than 11,000 of them. This airliner heritage confers robust reliability, the likelihood of finding other operators of similar aircraft wherever a customer flies, and an all-encompassing network supporting more than 500 customers and operators around the world. Airbus has sold over 170 corporate jets to date, and these aircraft are flying on every continent, highlighting their versatility.